2 How does a civil war start? In the case of the English Civil War, there was a series of small steps that increased tensions between two groups. Then all it took was a final spark to set off the war. 3 The situation in England changed rapidly in the years leading up to the war. Less than forty years earlier, the country was enjoying the reign of the popular Queen Elizabeth I. Nearly everyone was happy with the form of government in which a monarch made the decisions for the whole country. When Charles I took the throne, the country was still in a peaceful mood. Then things started to change. One event after another led to a bigger and bigger rift between the king and Parliament. 4 Charles I hoped to follow in his father's footsteps, and he began to take steps to recognize his father's dream of uniting England, Ireland, and Scotland. Charles believed that he had a divine right to rule and that his wishes should be obeyed. Parliament, however, was suspicious of King Charles' motives and of the effect that this might have on England. The steps towards civil war had begun. 5 Then, Charles I married the Catholic princess, Henriette Marie de Bourbon. This stirred up new doubts and fears as the members of Parliament worried about the possibility of a Catholic prince who would one day inherit the throne. 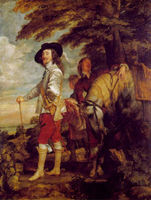 6 Charles wanted England to continue fighting in the Thirty Years War in Europe. Like all wars, this one cost a lot of money. Soon, England was in financial difficulties, and more controversies between Charles and Parliament resulted. 7 King Charles also wanted a uniform Church of England throughout the British Isles. He introduced a new version of the prayer book, the Book of Common Prayer. Violent protests broke out in Scotland. King Charles sent forces towards Scotland, but this time the conflict was settled by a truce. 8 In 1640, when King Charles was not able to get any more money from Parliament, he dissolved the Parliament. Later in 1640, a new Parliament was formed, but this one was even more hostile towards the king. At sessions of Parliament, they discussed their grievances against the king. 9 Then, in 1641, Parliament had Thomas Wentworth, the Earl of Strafford, arrested for treason. Thomas Wentworth had worked for the same causes as other members of Parliament on many occasions, but at other times he had chosen to support the king. This time when he chose to support the king, he found that the tide had turned severely against King Charles. He was considered a traitor and was executed in 1641.